Honda Rebel Forum > Honda Rebel Community Forums > New Member Introductions > Hello from Canada eh! After many years where I simply didn't have the time, I finally got a motorcycle license and started shopping for a bike. I knew I wanted a Honda, and was originally looking at nighthawks but found a deal on a Rebel that I simply couldn't pass up. Here she is, as she looked when I got her: a deep blue 1985 250 Rebel with 7900 original kilometers. Only modifications are the windshield, bags, and aftermarket adjustable brake and clutch levers (and associated master cylinder). I've since had a fantastic summer where I've put over 2500km on this bike, and started to personalize it, though I'll be posting those changes in a "build thread" style post in the modifications section. Nice to meet you all, and hope to share some of my experiences. Nice bike! Welcome to the forum. If you plan to keep the windshield (I would), you might want to tilt the top rearward some. The general rule of thumb is to angle it so it's generally parallel to the front forks. @flitecontrol: Thanks for the tip! However after some experimentation I ended up preferring to remove the windshield for the type of riding I do. @kryton: thankfully she does have an inline filter, it's just hidden behind the air-box cover at this angle. Check out my "build thread" in the "cool mods detailing and appearance section" for updates on what I do with it. 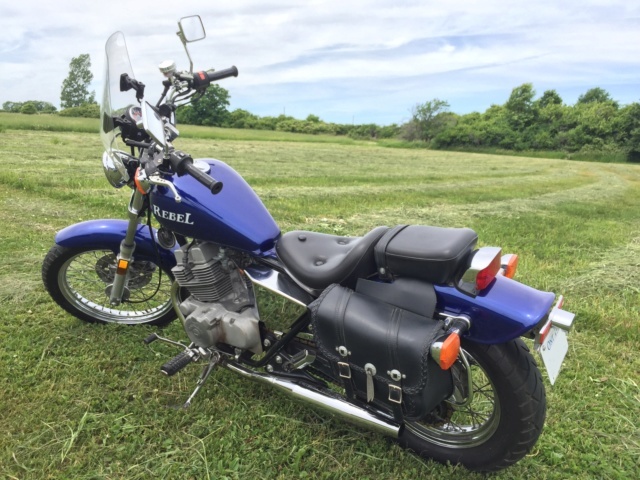 1985 Rebel 250 (in blue of course).